Are You Achieving Quality in Dementia Care? Are you a manger or senior worker within a residential care or nursing home that supports people with dementia? Do you want to improve your knowledge of person centred dementia care? Would you like to learn how to use evidenced-based, practical ways to support people with dementia to enable them to live well? If you have answered yes to any of these questions, you will be interested to hear about a programme of training that Warwickshire County Council have invested in for care home staff. We recognise the need to improve and sustain the quality of dementia care across the County. We are offering FREE accredited training modules for care and nursing home staff who work with people with dementia. These sessions will be delivered locally at training venues across Warwickshire by Professor Dawn Brooker’s team from the Association of Dementia Studies Worcester University. Leading person centred services for people living with dementia. A 4 day course, delivered in 2 blocks of 2 days of face-to-face workshops and a work-based assignment. This Course is aimed at care home managers who want to develop their dementia specific leadership skills and who deserve recognition in this challenging area of work. A 6 day course delivered face-to-face and work-based assignments over a 3 month period, in 2-day blocks. This course is aimed at people who work directly with people with dementia and have responsibility for the development and delivery of their care plans on a day-to-day basis, such as Activity Coordinators, Specialist Nurses, and Senior Care Officers. Undertaking individualised person centred assessments, utilising cognitive capacity, strengths and needs, taking into account physical health needs in the context of dementia, maximising freedom & choice. Remember, these two unique and useful training courses are being provided totally free of charge, so we are expecting a high level of interest and advise booking a place early to avoid any disappointment. This opportunity is being offered to support providers to achieve common standards in line with the recent contractual changes and fee increases. These changes stipulate that 1% of your fee rate is now specifically linked to performance in-line with these standards. As you will know from our last post, Warwickshire County Council and key partners are committed to Warwickshire becoming a dementia friendly community. You can read more about that here: Warwickshire Committed to becoming a dementia friendly community. We are thinking more about how we make Warwickshire dementia friendly and that means including as many organisations, businesses, groups and individuals from across the county as possible, which brings us on to today’s post. 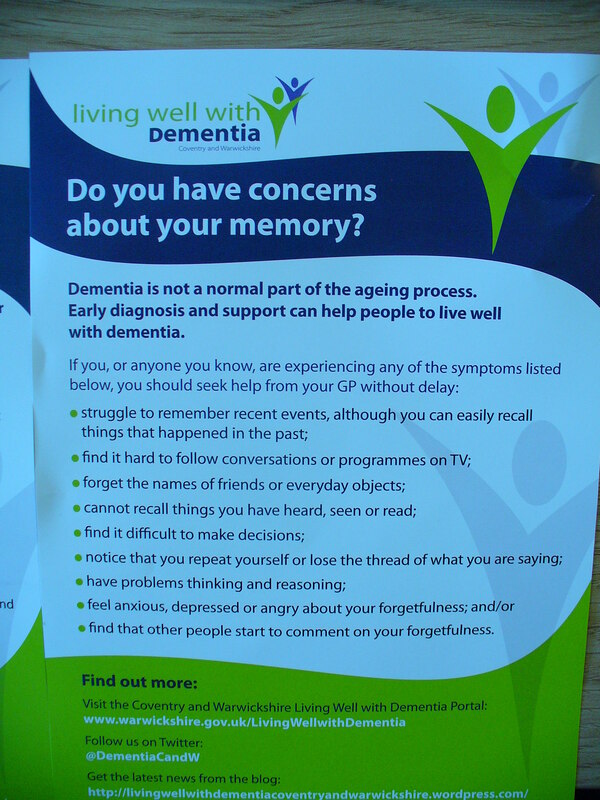 We have a range of dementia awareness materials such as leaflets, bookmarks and wrist bands which we have already distributed to a wide variety of local authority and health locations such as libraries, GP surgeries and pharmacies. 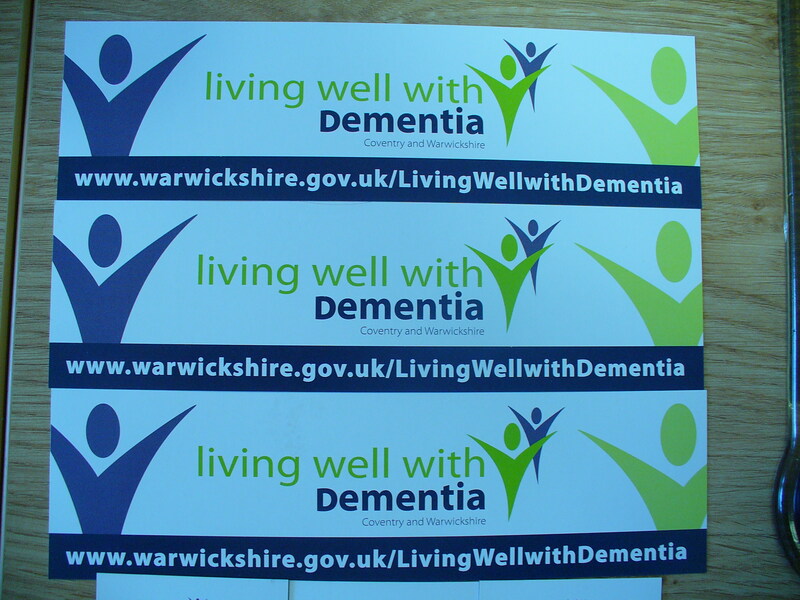 The feedback that we have received on these materials has been really positive and we are now we are hoping to see them distributed widely across the county to help promote the living well with dementia message. Do you own or run a business or organisation in Warwickshire that is regularly visited by members of the public? Would you be interested in having a selection of our dementia awareness materials in your reception areas and other public areas? Please don’t think we are only interested in seeing our materials in businesses and organisations that have a high number of visitors who are over the age of 55. Dementia is a problem for everyone, not just the elderly and everyone, from the very young to the very old, can play a vital part in helping to make Warwickshire a dementia friendly community. 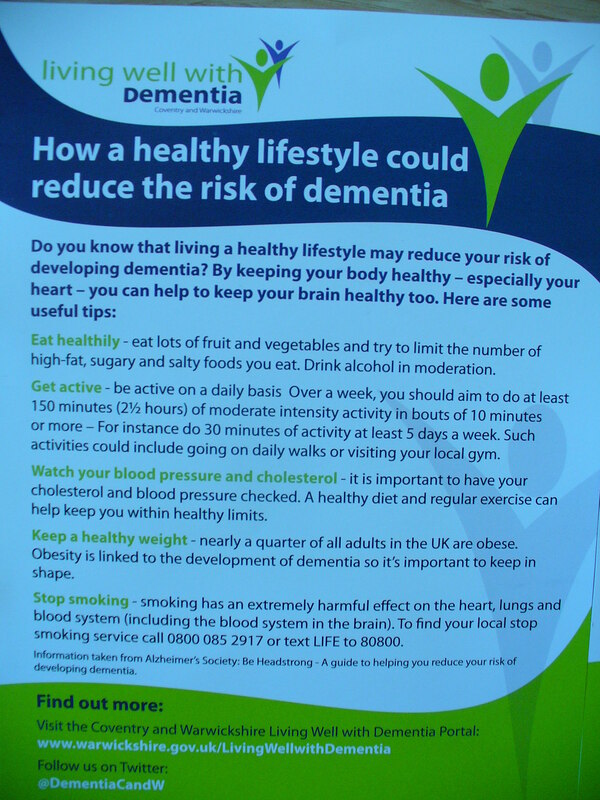 We have two attractive flyers; one covers the major signs and symptoms associated with dementia to enable people to spot these in themselves and others and the second covers how a healthy lifestyle may contribute to reducing a person’s risk of dementia. We also have dementia awareness bookmarks, featuring information on the Partnership, links to our online content and the highly-innovative dementia Portal. 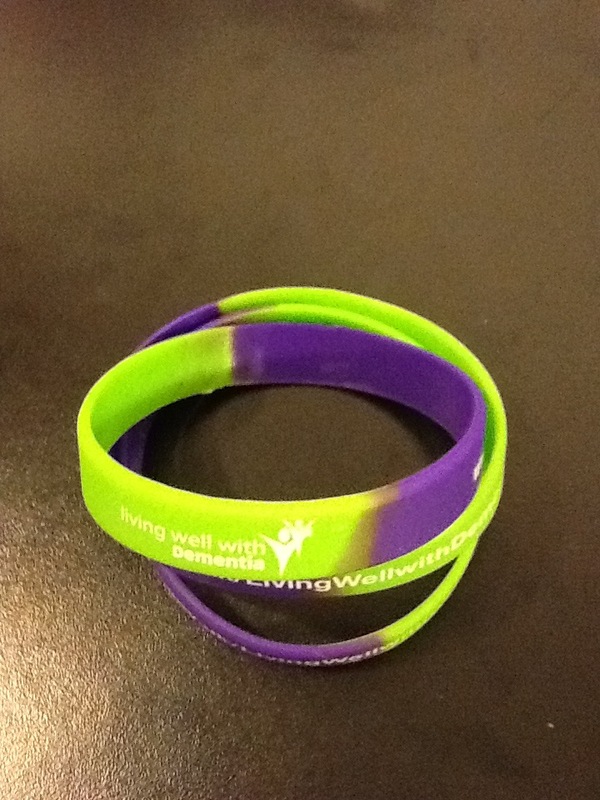 Finally, we have some rubber wrist bands featuring the Partnership logo and link to the Portal. If you would like to have a supply of our dementia awareness materials, please send an email with the name and address of your business or organisation to The Dementia Partnership and we will send you a supply through the post. We will also add you to our mailing list so you can get the latest news about our progress towards being dementia friendly and how you might be able to get involved more in the future. We are really hoping for a good response to this, as this will help our aim of making Warwickshire a better place for people with dementia to live and look forward to hearing from You.